Housewife, 32, with two children aged 4 and 8 months. Resident Friend of the Westminster Quaker Meeting House for nearly three years. Street Representative for the Covent Garden Community in the St. Martin's Lane area. 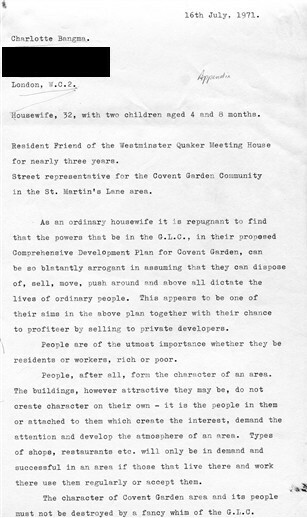 As an ordinary housewife it is repugnant to find that the powers that be in the G.L.C., in their proposed Comprehensive Development Plan for Covent Garden, can be so blatantly arrogant in assuming that they can dispose of, sell, move, push around and above all dictate the lives of ordinary people. This appears to be one of their aims in the above plan together with their chance to profiteer by selling to private developers. 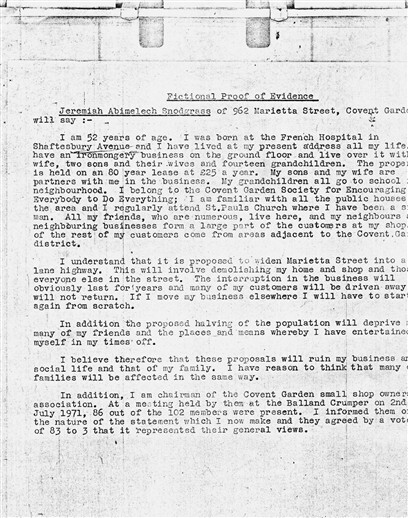 People are of the utmost importance whether they be residents or workers, rich or poor. People, after all, form the character of an area. The buildings, however attractive they may be, do not create character on their own - it is the people in them or attached to them which create the interest, demand the attention and develop the atmosphere of an area. Types of shops, restaurants etc. will only be in demand and successful in an area if those that live there and work there use them regularly or accept them.The character of Covent Garden area and its people must not be destroyed by a fancy whim of the G.L.C.